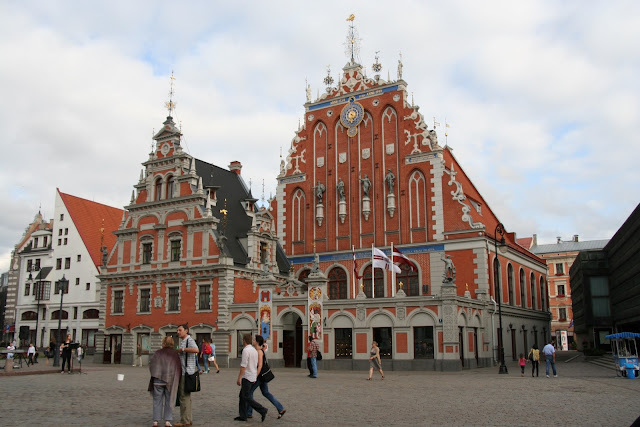 Here we are in Riga, capital of Latvia after a four and a half hour bus trip. Glad to hear you are in Oslo Kate, although you had better wrestle that map from Jonathan. Thanks for the comment on my blog, at least one of my children still thinks about her mother!!!! The bus trip was better than flying on an A380, the seats were bigger, and it even had foot rests, something the A380 didn't have. Apart from watching the countryside slip by I watched a movie,could have free coffee and there was free Internet. I picked up a map later showing free Internet places in Riga and you can hardly see the map for all he spots with free Internet. It amazes me that these small countries are so advanced with regards to the Internet. I shouldn't be as the are quite progressive as Estonia is where Skype originated and Nokia first made tyres in Finland before branching out into phones etc. Not a gorgeous as Swedish Red barns but still good to see. We drove through lush green pastures most of the way, glimpsing the Baltic occasionally as well as the odd shabby red house. Across the border the road became rough and things looked very tired. 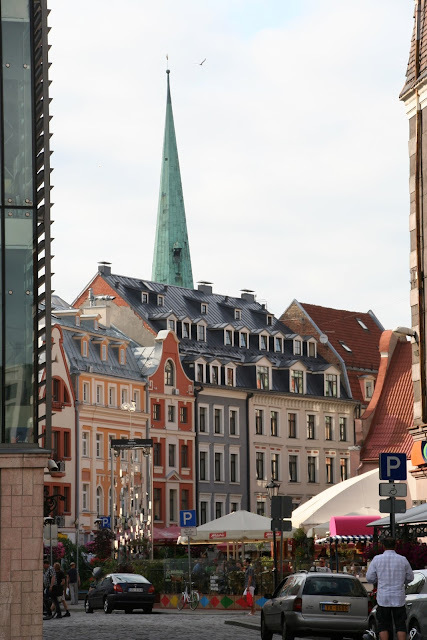 Latvia suffered an economic crisis before the GFC with a property boom, housing went up 5% per month until the crash and there was a lot of very high personal debt. Estonia wasn't in the same situation so they are a lot better off. In Estonia they all drive cars that we couldn't afford and even the taxis are Mercedes. A different story in Riga with older cars. We went from the sublime to the ridiculous with our hotel as well, at the Radisson we had a gigantic room with a bathroom to match. The tv seemed to take up an entire wall. Here in Riga we have gone back to the 50's, no complaints it is just a dramatic contrast. As usual we dumped our bags and set off for the old town just behind our hotel. It is a mixture of old and new. 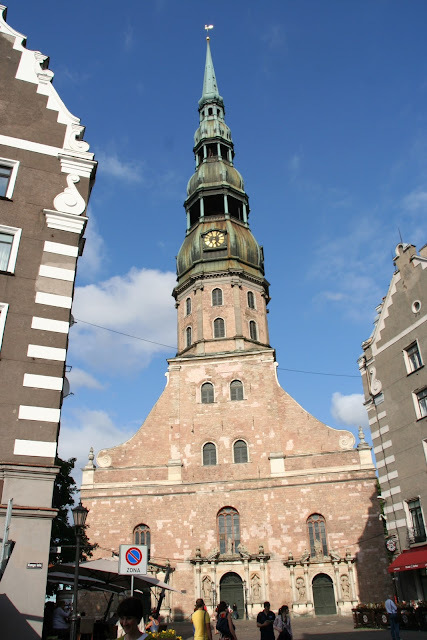 At first we couldn't work out why the old buildings would have been demolished until we read that Riga was heavily bombed during the war. There was one sparkling building in the centre of the town it was a Hanseatic building,there were many in Estonia as well. 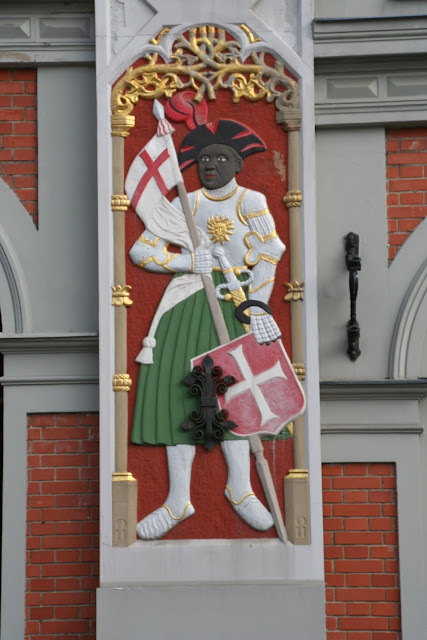 The Hanseatic were guilds of trading merchants mostly Dutch and German who traded throughout Europe and Asia, mainly through the Black Sea to Turkey in the 13-15th C. Riga was one of the ports as was Tallinn and Visby in Sweden. The unmarried traders had their own guild called the "Blackheads" and the building here that we saw was their guild building. It wasn't until I read in a brochure that it had been completely destroyed by bombing in WW2 but in 1990 an exact copy was rebuilt with its Dutch Renaissance facade. Tomorrow we are going on a bus tour as the city is quite spread out and one "newer" part of the city has a lot of Art Nouveau buildings, a third of the city's buildings are Art Nouveau. I recall reading it has the largest collection in the world, but I'll have to check. This sits behind our hotel, St Peters. Street scene. I think it has a heavy Dutch influence. 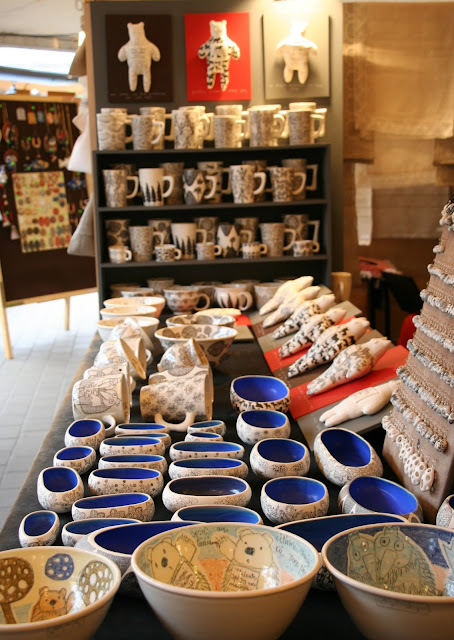 Again the ceramics does not really appeal, bit too gaudy for me. Apparently this is a traditional style as I have seen it several times. 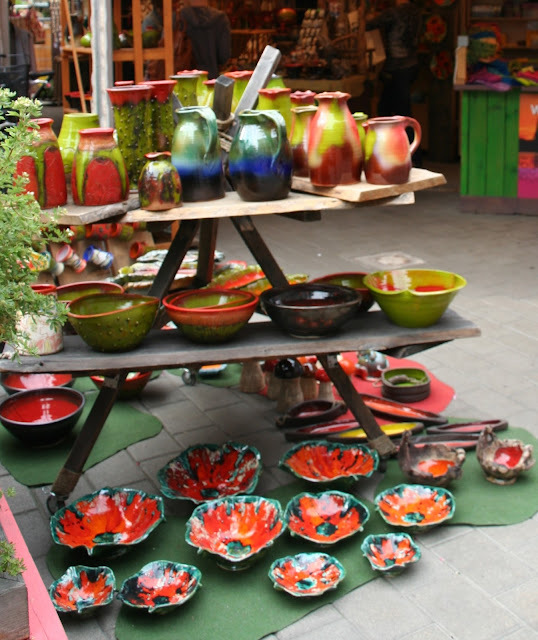 We went by an open air market and this stall below had a more modern pottery style. I have to finish with this slightly out of focus photo of a very strange vehicle I saw on our way back from dinner. 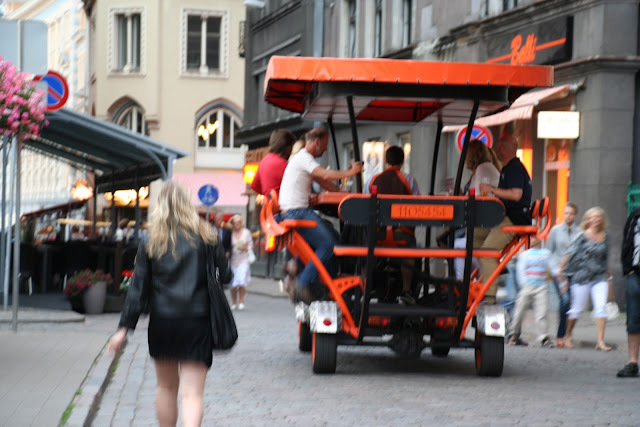 It is a self propelled bar, the patrons sit on each side as if at a bar and peddle like crazy while drinking beer. The sober fellow in front was the driver, apparently there is zero tolerance when driving. The bar? cart? truck? whatever, was occupied by a full load of Poms all shouting, peddling and drinking at once. Again it is late. Riga-mortis has taken hold in my hips, too much walking I believe over the difficult terrain of cobblestones yet again. Looks like its going to rain tomorrow so a bus is probably the answer although I have a brochure of 22 museums as well. Watch out Straddie Museum!